OBS Studio is a popular open-source solution for recording you gameplay, and more specifically, for blasting it out to the world. OBS Studio can broadcast your game streams to platforms like Twitch and YouTube, and OBS is also used for creating screencasts. It’s a powerful program, but it’s probably overkill for anyone who just wants a quick and easy game capture solution. OBS Studio packs a lot of features and settings, and if you’re willing to put in the time to learn it, this program offers amazing flexibility for power users. To ease the learning curve, OBS Studio includes a wizard to help you optimize your setup for streaming or recording video when you first fire up the program. OBS works best if you have a multiscreen setup where you can observe OBS on one display and play your game on the other, though that’s not a requirement. Unlike the other apps, OBS doesn’t throw up an in-game overlay. Instead, it just does its work in the background. You’ll also have to tell OBS to start recording or streaming once your game is running or just before you fire it up. OBS without an active recording using the dark theme. 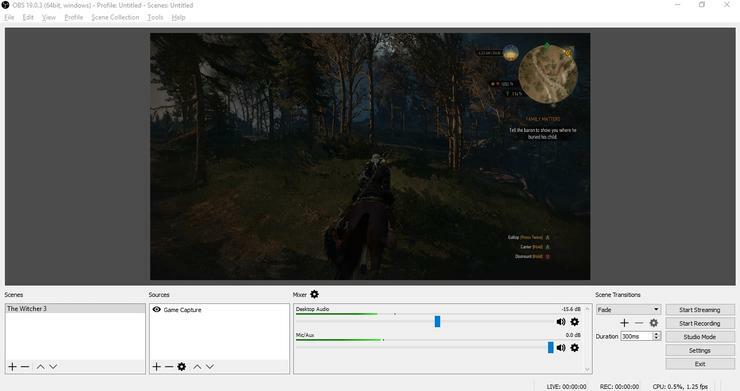 Unless you’re willing to put in some time to learn this software or have needs beyond simple game recording—professional Twitch streamers swear by OBS and its deep, configurable power—OBS Studio probably isn’t for you. 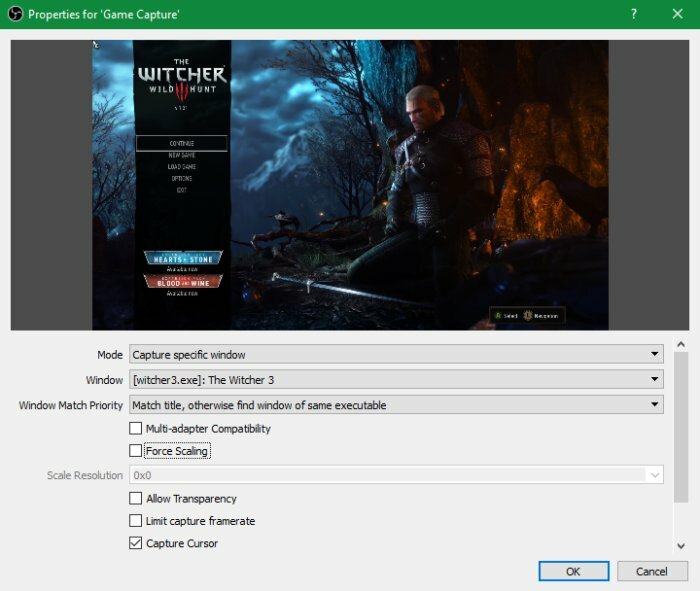 It also lacks some of the handy features that other programs such as Plays and Nvidia’s GeForce Experience enable by default. Namely, hitting a hotkey to hold onto the last few seconds or minutes of gameplay to record an amazing moment for posterity. You can set this up on OBS, but it requires some configuration and isn’t an out-of-the-box solution. When you do set it up, though, the feature is highly customizable in a way that other software can’t match. There are some situations where OBS is ideal over other solutions. If your plan is to record your gameplay and then create a YouTube playthrough tutorial, for example, then OBS Studio is a great option. You can also add any number of items to your stream or recording, including a picture-in-picture webcam shot, personalized watermarks, and more. To get started with OBS Studio you first create what is called a “Scene” that houses all your recording sources. Then you add the sources such as a game, your webcam, microphone, and watermark. If you want to see how this works in greater detail, check out our tutorial on how to get started with Twitch streaming. Once you’ve specified everything for recording, you click the Start Recording button, fire up your game, and then when you’re done click Stop Recording. Before running your first official recording you’ll want to confirm that OBS is configured properly and working before relying on it for a full gaming session. OBS Studio’s Settings offer an absolute ton of configurations, but the key ones you’ll want to pay attention to are under Settings > Output > Recording. Here you can specify the video encoder to use, the recording format, and recording quality. By default, OBS will choose hardware encoding, but that setting can get a little finicky. For the most reliable results beginners should use one of the software (x264) options instead. Another option to adjust is under Settings > Video. Make sure the “Base (Canvas) Resolution” is set to the resolution of the game. If you’re playing a game at 1080p on a 1080p monitor this won’t be an issue. But if your gameplay or stream quality is suffering at 1080p and you decide to drop down to 720p, then having the canvas resolution at 1080p means you won’t get a full-screen recording of your game. Instead, the 720p recording will sit in the upper left corner of the 1080p window. All these detailed settings, and OBS Studio’s lack of default hotkey settings for brief bursts of recording, are reasons to stay away for most users. Advanced users already familiar with OBS Studio, or those willing to put in the time to learn about the program, will find a host of configurable options they can use. OBS Studio is surprisingly low impact on budget systems. On the Metro: Last Light Redux benchmark our budget testing rig averaged 58 frames per second with everything set to low without OBS Studio running. Once OBS was going it dropped to 50.33fps. That’s a drop you might notice during heavy gaming moments, but it’s still well within the playable range for budget systems. The drop on The Division benchmark was even smaller, averaging 55.6fps without OBS Studio, and 51fps after it was running. 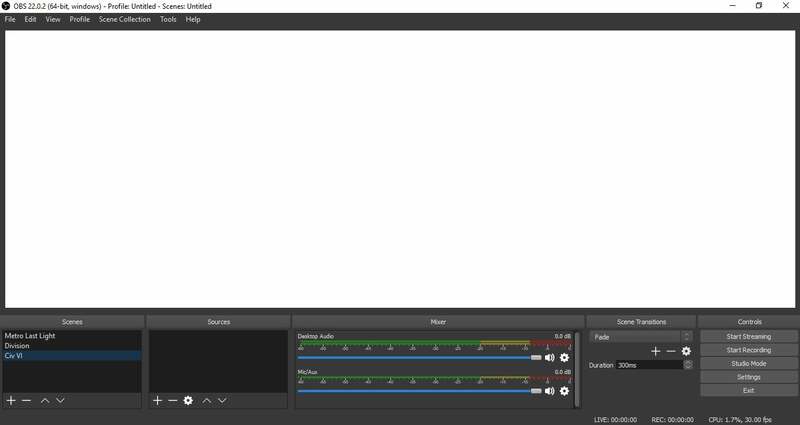 OBS Studio is a great program for advanced users. It can be configured to your needs as a recording program and even create a professional-level final product for sites such as YouTube and Twitch. It’s also pretty low impact on frame rates for budget systems. Novice users, however, should look elsewhere. OBS Studio requires some configuration, and does not “just work” like other options do. Still, if you’re willing to put in the time to learn the ropes it’s a great option.